Full-time courses run Monday to Friday for four weeks, plus the final weekend. Part-time courses run Tuesday and Thursday evenings (6:30 – 9:30pm) and Sundays for twelve weeks. Call us today! 2783 7100 (Mong Kok Center). The CertTESOL course is registered under the Non-local Higher and Professional Education (Regulation) Ordinance (Course Registration 252593) and accepted by the British Council. It is a matter of discretion for individual employers to recognize any qualification to which this course may lead. 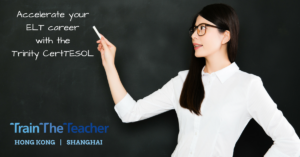 Find out more at the Train The Teacher CertTESOL page!